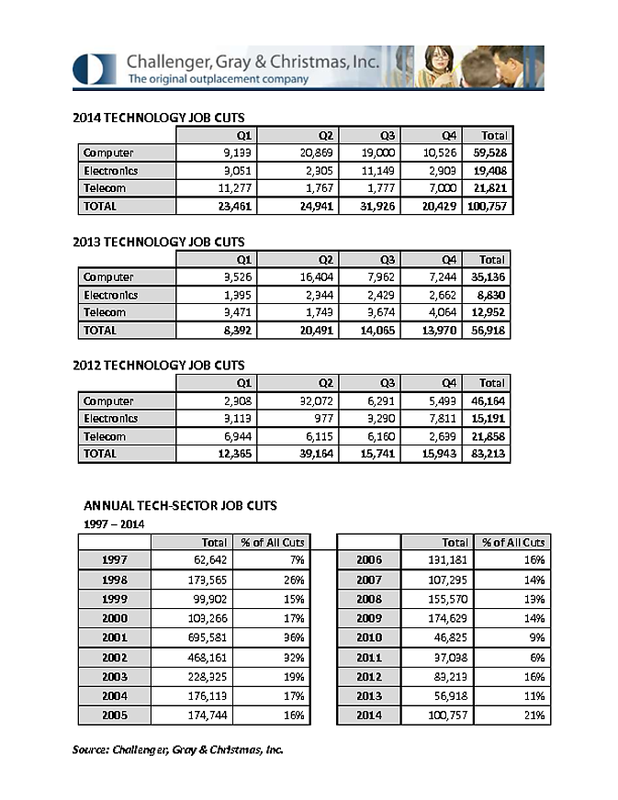 2014 Tech Cuts Report: Tech Sheds 100,747, 21% of All Job Cuts | Challenger, Gray & Christmas, Inc. Employers in the technology sector announced a total of 100,757 job cuts in 2014. That was up 77 percent from 56,918 in 2013, according to a semi-annual report on tech layoffs released Monday by global outplacement firm Challenger, Gray & Christmas, Inc. The heaviest tech sector downsizing occurred in the computer industry, where employers announced plans to cut payrolls by 59,523, a 69 percent increase from the 35,136 job cuts by these firms in 2013. While computer firms experienced the most job cuts, the biggest increase in job-cut activity occurred in the electronics industry, where annual job cuts surged 120 percent from 8,830 in 2013 to 19,408 last year. The 2014 total was the largest for the electronics industry since 65,300 layoffs were announced by these firms in 2009. Job cuts in the telecommunications industry also increased in 2014, rising 68 percent to 21,821. The increase comes just one year after annual job cuts in the industry shrank to 12,952, the lowest 12-month total on record. 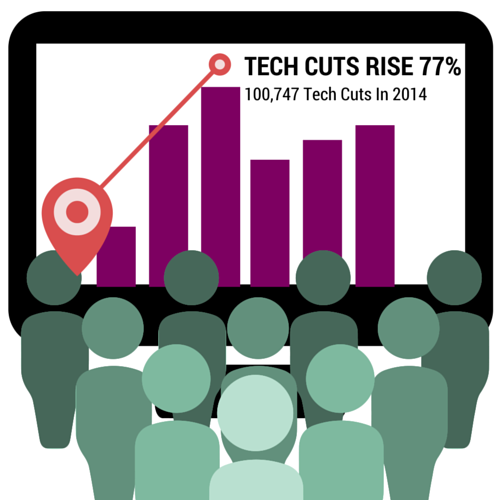 Overall, the tech sector was responsible for 21 percent of the 483,171 total job cuts announced in 2014. It was the first time tech-sector job cuts exceeded 100,000 since 2009, when they reached 174,629. “Oddly, the technology sector was among the stronger segments of the economy in 2014 and is likely to be a source for continued growth and job creation in 2015. However, we did see several large scale layoff announcements from tech giants, including 18,000 from Microsoft and 16,000 from Hewlett-Packard, which has now shed more than 50,000 workers since 2013,” said John A. Challenger, chief executive officer of Challenger, Gray & Christmas. “Announcements from other old-guard tech firms, such as Cisco Systems, Intel and Symantec, are not indicative of a sector in decline, but of one that is in flux. Several of the firms announcing job cuts in 2014 mentioned the need to be more nimble and streamlined to remain competitive. “Technology is sector where trends shift quickly and companies have to be able to pivot in response without enduring several quarters of earnings losses. It is common to see simultaneous job destruction and creation, as employers shed workers in one area, while building up another. So, the heavy downsizing that occurred in this sector last year should not be cause for alarm,” noted Challenger. Indeed, the majority of market analysts are forecasting strong growth for the tech sector, based on heavy demand among consumers and business. The continued expansion of Big Data, cloud computing and the need for stronger information security will drive job growth throughout the industry. In a recent survey by industry trade publication InformationWeek, 74 percent of tech professionals see rising demand for IT within their companies, while nearly 60 percent said their companies are boosting IT spending in the coming year. The biggest obstacle to tech-sector job growth may be a shortage of available workers. Another InformationWeek survey found that 88 percent of respondents from companies with 1,000 employees or more said there is an IT talent shortage. Nearly three-quarters of respondents from smaller companies said the same.